Paul Walsh. Star Tribune - Minneapolis, Minnesota. Fri, 26 Apr 2019 02:32:59 +0000. Daily Mail. Fri, 26 Apr 2019 02:11:33 GMT. First-ever tally discussed in candid meeting with more than 400. Shannon Prather. Star Tribune - Minneapolis, Minnesota. Fri, 26 Apr 2019 01:42:15 +0000. The new space will be used to expand At Last! 'Gourmet Foods capabilities to produce its fresh, made-from-scratch soups. Alex Van Abbema. American City Business Journals. Fri, 26 Apr 2019 00:31:10 +0000. Amy Forliti. Fox News. Fri, 26 Apr 2019 00:26:16 GMT. Reuters. Thu, 25 Apr 2019 20:08:18 -0400. New Zealand Herald. Fri, 26 Apr 2019 11:56:55 +1200. Prosecutors rested their case against a former Minneapolis police officer. ABC News. Thu, 25 Apr 2019 17:03:41 -0400. ABC News. Thu, 25 Apr 2019 15:33:15 -0400. New York Times. Thu, 25 Apr 2019 18:09:38 GMT. Fox News. Thu, 25 Apr 2019 15:10:16 GMT. Yahoo. Thu, 25 Apr 2019 07:17:59 -0400. The longtime member of the Minnesota Vikings signed a one-day contract so he could retire with the team Wednesday. William Bornhoft. Patch. Wed, 24 Apr 2019 17:07:03 -0400. According to the 2010 census, the population of Minnesota was 5,303,925. In 2008, the estimated population of Minnesota was 5,220,393, whereas in 2006, the population of Minnesota was about 5,143,134. For detailed, up-to-date information about Minnesota's demographics, visit the U.S. Census Bureau's QuickFacts about Minnesota web page. For maps of Minnesota, visit this Minnesota Map website. 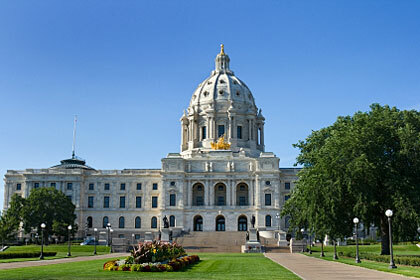 The photograph above shows the state capitol building in Saint Paul, Minnesota. Minnesota newspaper publishers are listed here, along with their addresses, phone numbers, and website links; Minnesota library names, descriptions, and website links are listed on this page. More information about Minnesota can be found here.